Hold onto your seat because this album came completely out of nowhere! 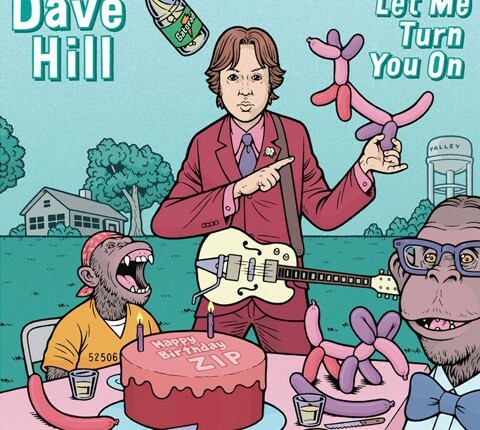 But, now that Iâ€™m aware of Dave Hill, the guy seems to pop up everywhere. Like, he hosts a show on WFMU and he plays in the band who wrote the theme song to John Oliverâ€™s Last Week Tonight. Also, did you know heâ€™s Clevelandâ€™s pride and joy? Also, heâ€™s a comedian and this is his first comedy album. But this isnâ€™t your granddaddyâ€™s comedy albumâ€¦ or maybe it is? Let Me Turn You On is a conglomeration of everything that is Dave Hill and is composed of one liners, hilarious anecdotes and spoken word accompanied by music (so not funny songs, okay? ), and does all of it surprisingly well. Again, I say â€œsurprisinglyâ€ well because I didnâ€™t know who Dave Hill was before I popped this CD in. Another thing is that whether youâ€™ll like this album or not may be entirely dependent upon whether you appreciate his delivery style which is half swashbuckler, half whisper-shouting and half trying to eat his own sentences. Right there, thatâ€™s 150% of the CD! And I can confess that I found half of that pretty hilarious.